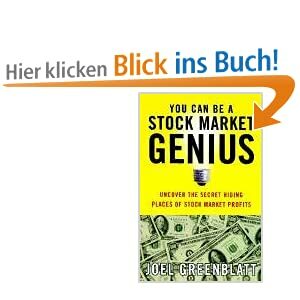 When Joel Greenblatt published this book in 1997,he had a tremendous run as manager of Gotham capital. The book is aimed towards the “average” investor and makes the case for investing in special situations. The best special situation he recommends are spinoffs, when a usually large company is spinning off a part of its business in the form of stocks which are simply distributed to the owner of the large company. As the owner of the large company don’t really want this stock, this creates an investing opportunity, especially if the management of the spin off is incentivised correctly. He touches a couple of other special situations (merger securities, recaps, reorganisations, companies emerging from bankruptcy), which should be well known to people having read “Margin of safety” or other value oriented books. The case studies in the book are good, it is interesting to see that Greenblatt invests even in highly indebted companies if they are “special”. For a European investor in our time howver, the book contains only partly directly actionable advise, as spinoffs are avery rare breed today. However it is still a very good books which shows that “special situation” investing can lead to great investment results. Summary: I think the book is a good start for anyone who wants to have an “easy to read” entry into the world of special situation investing, although the focus of the book might not be easily applicable in current times. Keine Steuerberatung: Ich empfehle dann auch die steuerliche Behandlung anzuschauen. Das deutsche Steuerrrecht war da immer sehr unlogisch 🙂 Deutsche Broker buchen die spin-offs gerne als Dividende, welche nicht in den gleichen Topf wie Kursgewinne fallen. Ich muss zugeben, dass ich daher auch lieber nach dem spin-off kaufe. Von den Gebühren her sind die US Börsen im Prinzip billiger als die deutschen, aber nicht bei deutschen Brokern. Der Markt scheint da nicht effizient zu funktionieren (zu wenig Konkurrenz) und deutsche Broker kassieren auch hohe Gebühren für den simplen EUR/USD Wechsel. Kann man nicht einfach in die Spinoffs am US-Markt investieren? Nachteile wären ein wenig höhere Broker Gebühren und Währungsrisiko, oder entgeht mir da noch etwas? Ja, kann man. Aber die Spin offs sind auch nicht mehr die “Goldmine” wie früher.